Twenty-six hours after I arrived at LaGuardia Airport, I landed in Mobile, Alabama. I'll spare everyone the details of my adventure, but it was one of those rare times when I wondered why I like to travel so much. Still, I made it to the Mobile Tennis Center by 2:00 pm when the singles were ending and the doubles just getting started. Doubles has been the game on my mind these days (I'll skip the shameless plug for my book, but you can keep up with the progress on http://www.myspace.com/americandoubles) and I enjoyed watching some I knew and some I've been anxious to catch. As usual, I made my way first to familar territory and checked out what the Eastern kids were up to. I caught some good points at Rajeev Deb-Sen & Jason Magnes (pictured above) vs. Bryan Swartz & Eric West before the latter won, 6-3,6-1, but the real excitement was a few courts away. When I arrived at Conor Berg & Spencer Talmadge (pictured left) vs. Haig Schneiderman & Robert Wong, Conor & Spencer had won the first set (6-3) and it was 6-5 to Haig & Robert in the second. 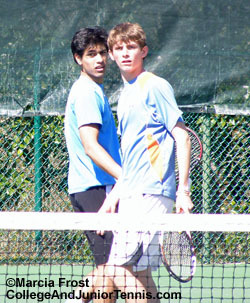 It was an unusual junior doubles match with a lot of points played with all four players at the net. 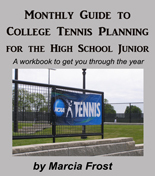 I enjoyed the excitement and it continued through the tiebreaker (to Haig & Robert, 7/3). The second set also went close to them 6-4. Grace Min & Lauren Herring are no strangers to doubles and certainly know each other. The two have been meeting in the finals of tournaments as partners and on opposite sides of the court. Despite all their play together I had yet to catch them as a team. It was quite a show from these 14 year olds. They displayed great volleys and teamwork, and had a lot of fun out there. Even their opponents, Alexandra Leatu (pictured right) & Hideko Tachibana, kept it light, though they fell 6-3,6-4. My last stop before succombing to exhaustion was to see two girls who I've been watching on the east coast since the 12s Zonals. They aren't 11 anymore and Caroline Davis is getting ready to attend Harvard, while Shoko Okuno will be a freshman at Columbia. Today they did a good job of sharpening those pre-college doubles skills as they dismissed Erin Colton & Brittney Faber. After a good night's sleep I'm looking forward to a full day of tennis (and no traveling) at the USTA National Spring Championships. Well, I'm still on my way to Mobile. After seven hours and two cancelled flights, American Airlines finally admitted that there was no way out of New York yesterday. I spent the night (or at least a few hours) sleeping at a local hotel. I headed back to LGA at 4:30 am (of course this had to be the night we lose an hours' sleep!) only to find out my morning flight was also cancelled! I am now booked (notice the word "booked" as I am not optimistic enough at this point to think I'm "going") on a flight to Chicago with a connection to Mobile. 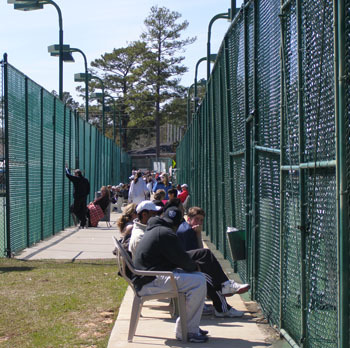 It is a possibility that there may actually be a story and a photo or two from the USTA Spring Nationals today. Stay tuned.